Description of "Business Information Systems - 2nd revised edition (eBook)"
This short book that introduces business managers to the key elements of software systems engineering in a manner that is radically different from that found in any contemporary text book. Structured as a dialogue between an expert and a novice – in the Upanishadic traditions of India this book leads the reader through the technology issues and management processes that are crucial for the successful deployment of information systems. He has been a footnote in the Great Indian Software Story and was worked in Tata Steel, Tata IBM, PricewaterhouseCoopers and IBM, doing – and in the process learning – all that can be done with and around the software business in India and the world. From in-house software development, through management consulting, global delivery of software services and most importantly teaching a generation of IT consultants about how to make the best use of this fascinating technology. As an extension of his intense involvement with in-house training programs he switched careers, entered academia and is currently a tenured Professor at the Vinod Gupta School of Management, IIT Kharagpur where he currently teaches systems related courses to management students. The current book is a persistent by-product of the lectures that he delivers at these colleges and incorporates the experience that he has gathered while teaching this subject. His current research interest is in the area of Web 2.0 and he has created a unique social network platform – the Kollaborative Klassroom – for his students. 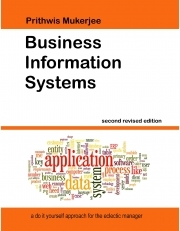 Reviews of "Business Information Systems - 2nd revised edition (eBook)"